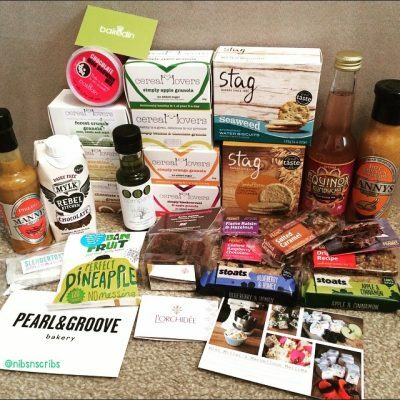 The first I had heard of The Grown Up Chocolate Company was when the super-dooper, lovely bubbly Cupcake Snack Warrior over at Reaching for Refreshment sent me one within a stash of goodies. These bars are not for little monsters and luckily I don’t come under that category! So what do I have here? 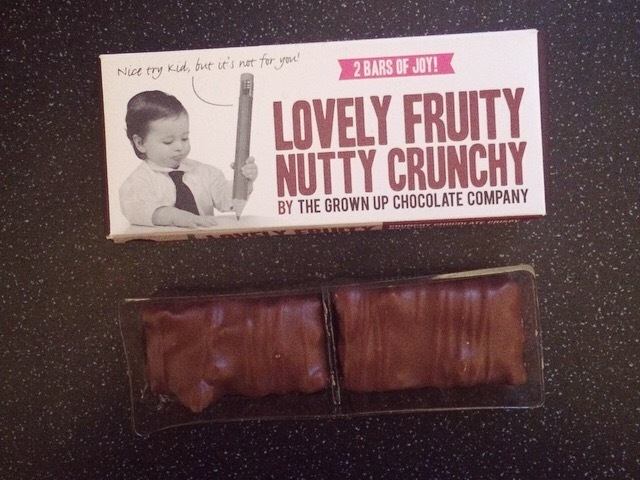 The Grown Up Chocolate Company Lovely Fruity Nutty Crunchy Bar* is what I have. I challenge someone to say that 10 times over! First off I am a big fan for UK made products, and I am pleased too see these bars are ‘handmade with love in the UK’. 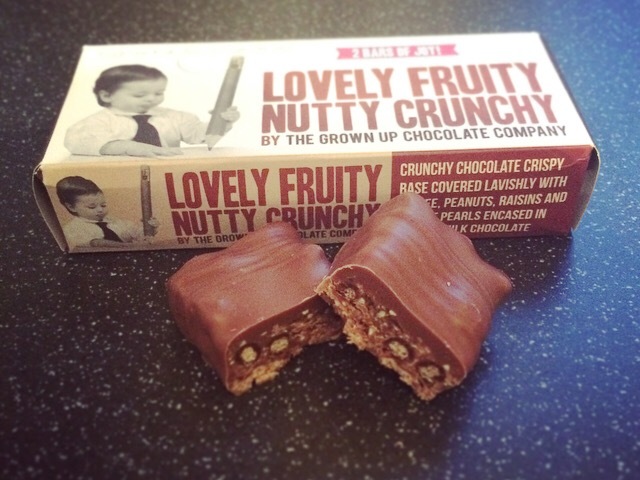 What is a Lovely Fruity Nutty Crunchy bar I hear you ask? Split into two bars we have a crunchy chocolate crispy base, covered with toffee, peanuts, raisins, and biscuit pearls, all within creamy milk chocolate! Looking at the size of these bars I am surprised they could fit all of those ingredients in there! 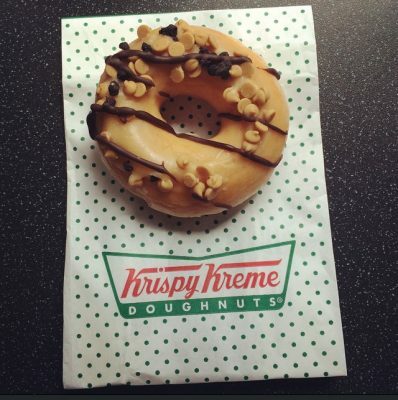 The chocolate is milky and not too thick, you get the chewiness of toffee with a delicious peanutty taste, but not so peanutty that that’s all you can taste for hours. The crispy base and crunchy biscuit gives these bars the break in texture it needs. What with the toffee, raisins and milk chocolate, I am pleasantly surprised that it is not too sweet either. I have to admit I couldn’t taste the raisins, but to be frank that doesn’t bother me. Size wise, if they were individually wrapped they’d be perfect, but they’re not, and they are a tad too big to eat both in one go, even for me, and given the plastic wrapper was not salvageable once opened, your left with eat them both / share, or put back in the box to go soft. Was it nutty and crunchy? – yes. Was it fruity? – no, but hey I can live with that. Overall were they 2 bars of joy? Yes they were. They reminded me of a Cadbury’s Picnic bar, but posher, and I’d certainly have this bar again. The Grown up Chocolate Company do quite the array of chocolate bars, all for grown ups of course, and I am certainly on the lookout for a number of these bars especially the Superb Salted Caramel Peanut one! Miss Snack Warrior has also done a review on the White Chocolate Praline Wonder Bar, so go check that one out here. Rather her than me as me and praline do not see eye to eye! If you fancy a try for yourself, or want to know who they are and what bars you can buy, visit The Grown Up Chocolate Company website here. As always feel free to leave your thoughts and comments.